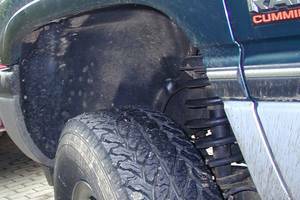 MoTip Underbody Protection (Bitumen) forms a delicate elastic, durable seal on the underside of machines, vehicles and wheel cases for all types of vehicles. 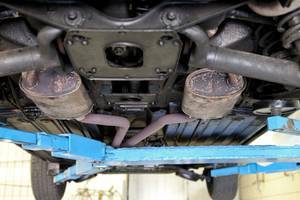 It protects the undersides from the mechanical and chemical stress of stone chipping, grit, water, rust and the effects of weather. Thixotropic properties mean the spray can be applied in thick layers without running. 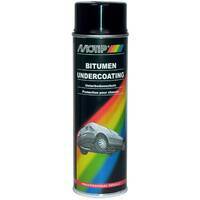 Available in 500ml spray cans and also in 1 litre spray gun cans as well as in 1.3 kg and 2.5 kg paint cans. 1000ml: 1.03 - 1.06 kg/ltr. 1.3 kg resp. 2.5 kg: 1.26 - 1.30 kg/ltr. The water-based underbody protection cannot be painted over. For visible bodywork, we recommend applying a topcoat of MoTip stone chipping protection. Remove old paintwork and rust, then sand. Bring the can to room temperature. Shake can before use and test spray. Apply several thin coats from a distance of ca. 25 to 30 cm. After use, turn can and spray empty to clean the valve. The surface should be clean, dry and free of grease. Screw 1000ml bottle in special compressed-air spray gun. Operational pressure 3 to 6 bars. Apply underside protection in the desired thickness. With thick layers, leave individual layers to dry. Sprays without forming mist, and does not leave dangling threads or drips.. Thin with solvent according to use. Fresh dirt on equipment can be cleaned with solvents if necessary. MoTip underside (bitumen) can be applied in thick coats without dripping with a paintbrush or spatula.